When the pallet loads are not too high this gate can be made with very short side frames the fold down inner gate can operate within very low headroom. Up to 3000mm inside width (2 pallets) x minimum 2000 mm walk-in height x 500 mm deep side frames (When closed). 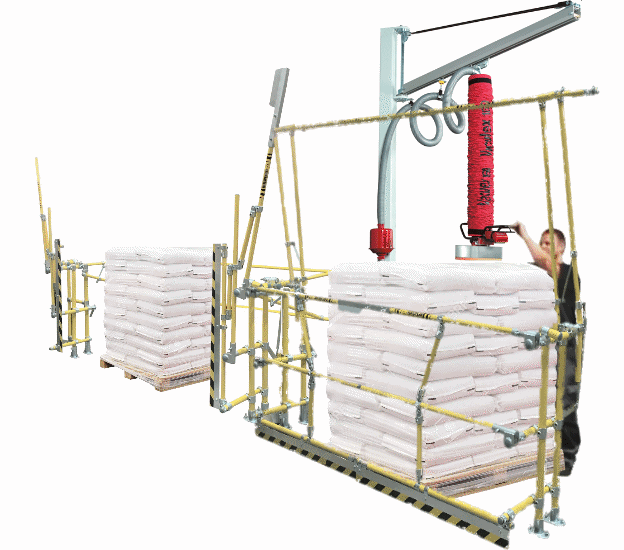 The inner gate is modified to swing forward which allows the operator to swing the vacuum handler over the pallet to safely pick sacks from the pallet. The ergonomically counterbalanced gates offer easy operation. The operator pulls back the inner gate which is connected to push rods on the side frames. As the inner gate lowers the edge gate automatically opens. The system provides continous protection from falls and moving loads.